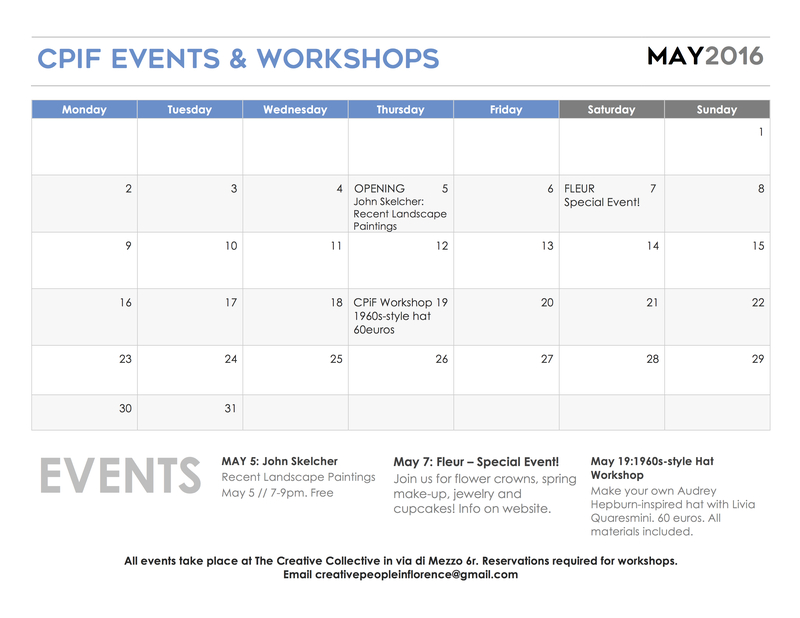 Creative People in Florence is happy to announce the Spring Workshop Series hosted by The Creative Collective. The workshops are run by selected CPiF members and cover a wide variety of creative techniques and skills. Check out our workshop calendar below (updated monthly), and scroll down to check out our instructor bios and workshop descriptions. To sign up for a workshop email us at creativepeopleinflorence@gmail.com. All workshops take place at The Creative Collective in Via di Mezzo 6r. Sara is a contemporary jewelry artist from the United States and a graduate of the Art Center College of Design in Los Angeles California. A long-time resident of Florence, Sara works from her studio/store in Via di Mezzo where she makes her jewelry from polymer clay. 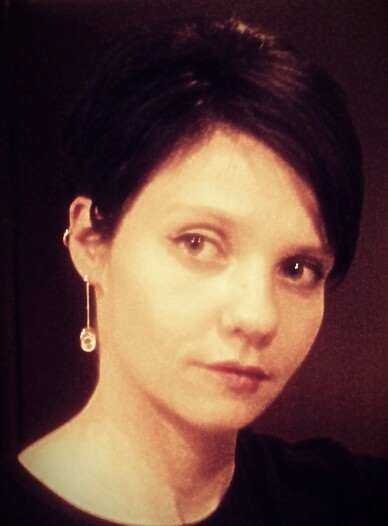 In addition to her experience as a jewelry artist, Sara is also the co-founder of Creative People in Florence. See more here. An introductory lesson into the versatility and various uses of polymer clay. Learn how to condition, blend, texture, and create patterns through various techniques. Firing methods and finishing techniques will also be taught. You will create a work of your choosing and learn all steps necessary for its completion. All materials are included. There will also be a break for lunch. Originally from Russia, Mike has been living in the greater Florence area for three years working in web development and textiles. Mike is an experienced front-end developer and designer, as well as a project manager. His small business French Lace sells artisan lace all over the world. INFO SESSION: Business Analysis and Web Development. Mike will present an overview of workshop topics designed for working artists and designers. Over the course of the information session he will outline areas in which he can help you develop your business and online presence. These topics will be covered futher in following workshops or one-on-one sessions, based on what individual participants feel would be most beneficial. This meeting is FREE and open to all. Clara is the owner of Cavale Studio, a jewelry line based in Chicago. She is a contemporary jewelry design student by day, a flower and plant enthusiast by midday, a voracious food blog reader by late afternoon, and a budding competitive trip booker by night. She loves to learn from others and share the knowledge that she has gained along the way. This two hour workshop will open your eyes to the delightful world of terrariums. Participants will be guided in designing and building their own terrariums with a variety of materials. Clara will offer design tips and teach participants to properly care for their terrariums to keep them happy and thriving for the future. Please come prepared to get your hands dirty! All materials are included. Have you ever wanted the chance to let out your inner flower child? Now is your chance! Come join Clara Nguyen for an hands-on lesson in different blooms, the greens, and the process behind making your own dreamy flower crown. All materials included. Learn to make a gorgeous bouquet using Clara’s a simple but effective handheld technique. This technique allows you to make a more natural looking bouquet. You will learn the difference between the the kinds of flowers, greens, and tools. All materials included. Originally from Moscow, Olga has a degree in Industrial Design (Middle East Technical University, Turkey), a masters degree in Interior Design (Florence), and since 2004 she has taught Industrial Design, Rhinoceros 3D, Manufacturing, Modelmaking and Furniture Design, and is currently an instructor at Florence Design Academy. She also collaborates with several design studios in Florence and Turin. For more information about Olga and her work, click here. Level 1: Basic Sketching for Product Design. Materials not included. Please bring an A3 sketchbook, pencils (H, HB, 2B), eraser, and a ruler. Livia studied fashion at the Machina Lonati Fashion and Design Institute and is currently a professor of various fashion disciplines at Florence’s Istituto Lorenzo de’ Medici. In addition, Livia is the co-founder of Fashionismas, and she also writes a fascinating blog on the fashion and costume history called A Fashion History.All workshops are designed by Il laboratorio del Made in Italy. A t-shirt is not a just a simple garment. It’s a symbol of youth and freedom. T-shirts are white canvases where you can express your own creativity. This workshop will provide you with the skills to customize your plain t-shirt and making it a couture garment. Pull out a white t-shirt and all of those little things you’ve carefully hidden away in your drawers: buttons, pins, fabrics scraps, trim, lace, tulle, sequins, pearls. Whatever you want! During this workshop you will sew your own custom envelope bag. Starting from a pattern, you will learn how to cut fabrics and sew the bag together. You will then learn to apply embellishments to make it the most unique bag in your closet! No sewing skills needed. Materials: Please bring old fabrics or old garments to use to cut the shape of the bag, buttons, sequins, pearls, or rhinestones to decorate your bag. 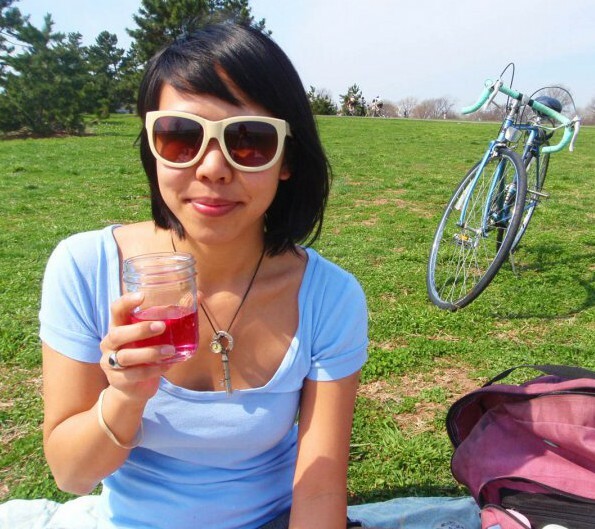 Alexandra Wong is a graduate of the Milwaukee Institute of Art and Design. Following her studies in fine art, she worked as an artist in San Fransisco and is now located in Florence, Italy. Alexandra is an intern for Sara Amrhein and Creative People in Florence.